The Teen Board produces two major runway fashion shows each year in both the Spring & Fall. In addition, smaller informal shows and mannequin modeling events occur throughout the year. Teen Board members are involved with a variety of special events and community service projects that take place at the mall during the course of the year. Be sure to check here for updates throughout the year. On Saturday, February 27th from Noon to 2pm, the Oxford Valley Mall Teen Board will be collecting gently used prom gowns, shoes, and similar accessories to help provide a special high school prom experience for other young ladies, whose financial situations are such as otherwise would preclude their ability to attend their prom. Donations will go to Fairy Godmother’s Inc. in Philadelphia as well as Becca’s Closest. The first 100 people to donate a used dress will receive a $5 Starbucks giftcard. Please check your closets and come by the mall to drop off your donations on the 27th! 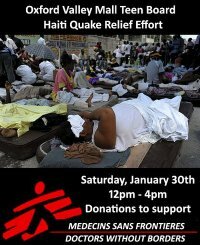 The Oxford Valley Mall Teen Board will be collecting monetary donations to support the Haiti Quake Relief Effort. All donations will be going to support the work of Doctors Without Borders. Please stop by the mall on Saturday, January 30th between Noon and 4:00pm and make a donation. The Teen Board donation station will be adjacent to Guest Services booth on the lower level.